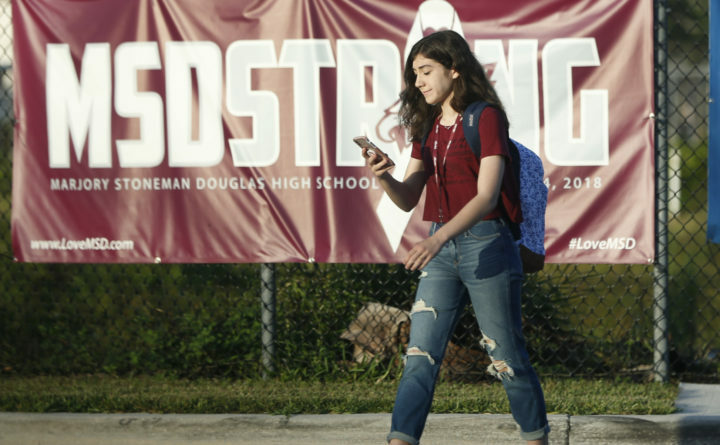 A student walks past an "MSDSTRONG" banner on the way to class at Marjory Stoneman Douglas High School in Parkland, Florida, Aug. 15, 2018. WASHINGTON — No marches are planned, no walkouts certain. As the anniversary of the shooting at Marjory Stoneman Douglas High in Parkland, Florida, approaches — a massacre that sparked protests nationwide — students in the Washington region are considering community service and the promotion of kindness and generosity rather than demonstrations. Michael Solomon, a 17-year-old 11th-grader at Springbrook High School in Silver Spring, Maryland, and president of MoCo Students for Change, said his group will attend the Tuesday “Walls of Demand” art installation in the District of Columbia created by Manuel Oliver to honor his son, Joaquin Oliver, among 17 students and staff killed in the Florida shooting. “We don’t want to walk out just for the sake of walking out,” he said. On Thursday, students at Bethesda-Chevy Chase High School in Montgomery County, Maryland, plan to hang 671 T-shirts in a “Memorial to Our Lives” art installation along the school fence lining East-West Highway. Each shirt honors one of the teenage victims of gun violence in the nation in 2018. A group called B-CC For Gun Control created the installation last year to raise awareness of everyday gun violence. Students Demand Action NoVa will distribute orange ribbons in Virginia high schools and encourage students to engage in acts of service, said Laura Kirk, one of the presidents of the group. Kirk, an 18-year-old 12th-grader at West Springfield High School in Springfield, Virginia, said it is important for advocacy groups to maintain the momentum that propelled them to action last year. “Gun violence prevention isn’t a sprint — it’s a marathon,” she said. Survivors of the Parkland shooting channeled their grief into a formidable wave of activism under the banner of March for Our Lives, the student-led movement that inspired people throughout the country to advocate for stricter gun control. On March 24, hundreds of thousands of people converged on Washington to attend the March for Our Lives. College chapters of March for Our Lives have organized service and activism events leading up to the anniversary. On Monday, Georgetown University students wrote postcards to lawmakers in support of a measure introduced by Rep. Mike Thompson, D-Calif., that would require a background check for every firearm sale. Students at George Washington University are selling orange flowers — the color adopted by many organizations to support gun violence prevention — to raise money for chapter lobbying activities. Students will also be invited to write “valentines” to their representatives in Congress, asking them to act on gun violence prevention. Seventeen flowers are expected to be scattered Thursday in the reflecting pool on campus as a tribute to the Parkland victims. Participants are also planning to volunteer next Monday at Miriam’s Kitchen, which provides meals to homeless people in Washington. Last week on a clear, sunny morning, more than 100 students ditched school and headed for the Capitol. Many came from high schools, colleges and universities in the Washington region. Some traveled from as far as Florida. All arrived Wednesday at the Capitol to advocate for stricter gun control. They packed the chamber pews to attend a House Judiciary Committee hearing on gun violence prevention. Students from Stoneman Douglas High watched from the crowd. March for Our Lives organized the student meetup. On the anniversary of the shooting, student activists won’t dwell on the harrowing memory of the Parkland tragedy, instead choosing to reflect on their efforts on behalf of stronger gun violence prevention measures. “It’s not about the tragedy. It’s about what came from it,” said Springbrook High’s Solomon.